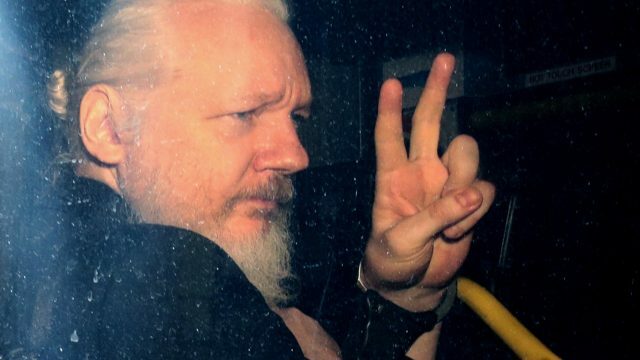 Last night, the Metropolitan Police served an extradition request on Julian Assange. This is nothing short of silencing the press, and it represents an important turning point in history. We must act. The unjust persecution of Julian Assange (and the knock-on effects the media will feel) should be the point we’re discussing – not your personal opinion of him. What a week it was. Julian Assange got a serious note from his landlord, a mother of two was charged with prolicide and one family member went to the football…long after his death. Well, it was a particularly brutal week, punctuated by the awfulness of Nauru, and a rather vivid plane crash. But hey, we all laughed at Julian Assange. That’s something, right? In an effort to force him out the door, the Ecuadorian embassy has instituted a raft of very serious house rules for Julian Assange. Alex Jones being kicked off the air was just the most notable neck chopped in a towering wave of sanctioned censorship. Geoffrey Robertson QC has defended Salman Rushdie, he’s represented Julian Assange, and now he’s pushing for an Australian Bill of Rights. Why have no media outlets stood up for Assange? The defence of Julian Assange has largely been left to the individual. Noticeably, no media outlets have stood beside him. Their silence speaks volumes. With Julian Assange set to be kicked out of the embassy, what happens next is crucial. We need to bring Julian Assange home. Not for him, but for us. The Australian government recently met with Julian Assange, if we were to free him, it would be an act that would revitalise our confused national identity. With the Ecuadorian President threatening to revoke Julian Assange’s political asylum if he continues to be Julian Assange, the future is desperately bleak. Good moleman to you. Overnight we saw the rise of the political millennial in Austria, Hillary Clinton absolutely destroy her ex, and the expulsion question shifted ever closer to Woody Allen’s doorstep. Good morning, class. What happened while you were asleep? Well, Assange packed his bags, Ewan McGregor chose life (over Piers Morgan) and Trump “didn’t” call for an investigation into the process that made him President (good call). Sweet, merciful Thursday. What happened while you were asleep? Well, Julian Assange will face judgement day, sort of, One Nation won their golden tickets and Nick Kyrgios rolled the eyes of a nation. With news that there will be no easy way out for Julian Assange, I find myself empathising with those stuck in the middle – the diplomatic staff of the Ecuadorian embassy. Ecuador claims responsibility for pulling plug on Julian Assange’s Internet connection on grounds of impacting US election. WikiLeaks’ inadvertent jeopardisation of women voters in Turkey has brought on a valid question: Are they accountable for the response to the information they expose? Rob Idol is back with his jaunty traipse down the week that was, including Trump’s reality check in Iowa and ongoing apathy toward refugees.